HURRY! 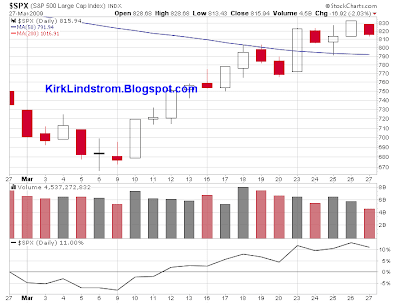 Subscribe NOW and get the April 2009 Issue of "Kirk Lindstrom's Investment Newsletter" for FREE! ! Mine did! 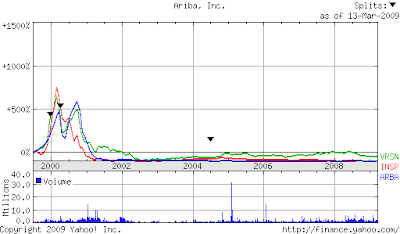 I had cash in the portfolio and told my subscribers to use it to buy some some Finisar (FNSR Charts) shares at $0.24. Today at 43¢, Finisar is up 79%! Why is Dylan Ratigan Gone from CNBC's Fast Money? Dylan Ratigan is no longer listed at host of CNBC's "Fast Money" nor is his picture on the Fast Money web page. Dylan hosted the show Thursday March 26th and was gone on Friday March 27th with Melissa Lee as the fill-in host. "More details are emerging about the abrupt departure of Dylan Ratigan from CNBC. We just got off the phone with CNBC spokesperson Brian Steel who says, "Dylan has told us he is leaving effective today." In what was a mutual decision, Steel tells TVNewser, "Due to the serious economic times in which we live, we made a decision that it would be a distraction for Dylan to host 'Fast Money' today." where he compared the people making money at the major investment banks to the crooks at Enron. He gives very clear details how "people" sold insurance for faulty investment products, kept the fees for the policies but had insufficient reserves to pay the claims most anyone with a brain should have expected given they were making loans to people who we knew could not pay them back once rates adjusted up or housing prices fell. What do you think? Why would he vanish without a word or a farewell party? With gains this week, we are officially in a new bull market. I hope you all did some buying near or at the bottom and are like me, looking for an opportunity to take profits. We won't know if this is another cyclical bull market in a long-term secular bear or the start of a new secular bull market until it ends. It does not really matter as I added to positions very close to the absolute bottom and plan to take profits as the market goes up. That will give me funds to buy any major "corrections" or bear market declines from the current level. If this is a major new bull market, what sort of gains can we expect? In the Fidelity article titled "How Will the Bear Market End? Historical patterns of stock market reversals" certified financial advisor Dirk Hofschire says the average gain in the first month of a new bull market is 12% of its entire gain. In the first year, we usually get 40% of the total price gain and 45% after counting for dividends. "evaluating all the bull markets since 1930, the first month of a new bull market on average has provided more than 12% of an entire bull market's gains, with an average return of 14% during these initial months (see Exhibit 3, below). Within six months, more than one quarter (27%) of an entire bull market's performance (on average) was already in the books. The first 12 months of the average bull market has provided more than 40% of an entire bull market's price appreciation, yielding on average 45% for investors -- well above the category's long-term average annual return of 10%. So while bull markets typically last an average of three years and have even spanned an entire decade, the biggest bang for the buck has typically come in the initial months of the rebound." What gains have we seen for this new bull market? 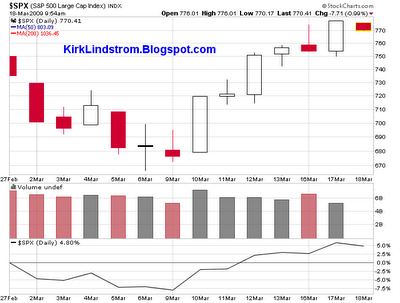 This chart above shows the S&P500 (charts) is already up 20.6% from its low on a closing basis. 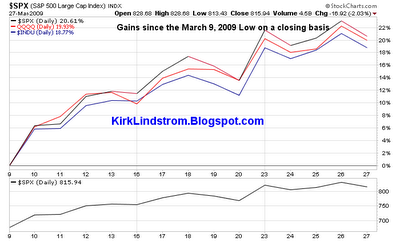 The DJIA and NASDAQ100 indexes are up 18.77% and 19.93%, respectively. This video shows Jim Cramer [Jim Cramer Fan Club] attacking NY Attorney General Cuomo as a communist for wanting to make it harder to get a loan. The beautiful woman is Erin Burnett [Erin Burnett Fan Club]. Cramer said Cuomo’s decision to question the housing bubble and the proliferation of no-interest, nothing down, tell-me-any-story-you-like mortgages was positively anti-American. Jim says doing this will shut down Washington Mutual, Fannie Mae and Freddie Mac... three companies that were not able to remain solvent on their own due to the housing collapse. Note the ticker on the screen shows the S&P500 was at 1495 when Jim want on this rant. "Cuomo says 'Lets make it harder to get a mortgage'"
"Cuomo says Lets make it harder to lend"
"Cuomo says 'I am going to shut down the mortgage market'"
"Cuomo says 'I am going to make it harder to get a loan.'" HURRY! Subscribe NOW and get the March 2009 Issue for FREE! ! I saw Doug say on CNBC TV that the market would make a generational bottom sometime in the next few days just two days before the S&P500 (S&P500 charts) hit 666.76 then rebound to 803.24, up 20.5%. "A guy who saw things coming when no one else did is a guy who may see things coming that no one else does." Cramer says he has known Doug for 15 years and Doug has "always been short" so to have Doug say it is a "a generational bottom" is "shocking" and worth paying attention to. I prefer to leave market timing to the soothsayers while I beat the markets using "core and explore" investing. 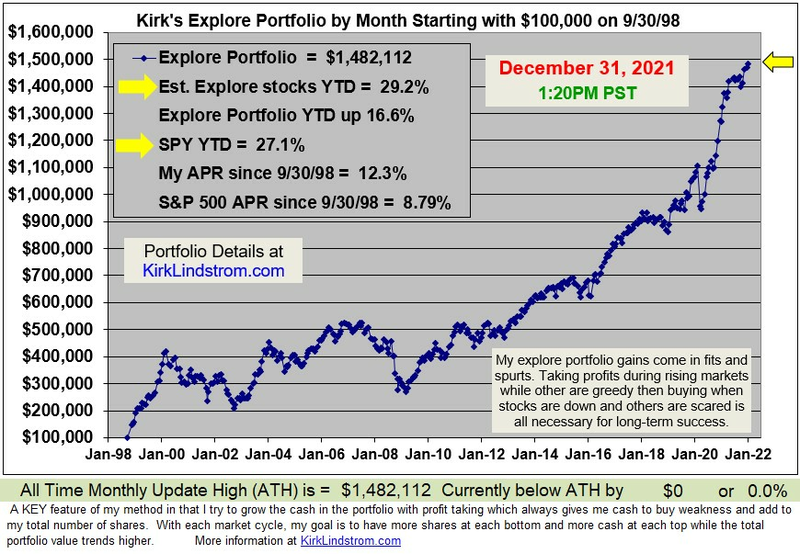 After the markets bottomed in 1998, "Kirk's Newsletter Explore Portfolio" gained 117% in 1999. After the markets bottomed in 2002, "Kirk's Newsletter Explore Portfolio" gained 77% in 2003. I look for similar gains after this bear market bottoms . The gains have already started since my portfolio, though down from the peak since I don't pretend to time the markets, is ahead of the S&P500 for both 2008 and 2009. CNBC's Mark Haines Calls "The Haines Bottom"
Mark Haines, CNBC's "Squak on the Street" co anchor with Erin Burnett (Erin Burnett Fan Club) called the March 10, 2009 market low the "Haines Bottom." Haines has been highly skeptical of prior bottom calls including the "Hogan's Bottom," the November 21, 2008 low, prior to the "Haines Bottom." At our "Investing for the Long Term" facebook discussion group, we are looking for an "IBD follow-through day" defined by Investors Business Daily here to confirm the rally. Any up day then counts as Day 1 of an attempted rally. Using closing data, Day #1 was Tuesday March 10. Request invitation to facebook's "Investing for the Long Term" discussion form. Yesterday, Nouriel Roubini, fondly known as Dr Doom, said this rally was a "dead cat bounce. On March 9, Roubini said in the best case he saw the S&P500 increasing to 720 before falling as low as 500 to 600. With the S&P currently at 756, Roubini was overly pessimistic. Could he be wrong about the dead cat bounce too? See our article "Nouriel Roubini, Dr Doom, Thinks DOW 5,000 is Possible"
Using "point and figure charting," the S&P500 target is 975, a gain of 46% from the bottom at 666. "Nouriel Roubini, Dr Doom, Thinks DOW 5,000 is Possible"
If this was a fight, they would have stopped it in the first round. I think Stewart was 100% dead on target. He has no problem with Cramer selling himself as entertainment or a news reporter if he reports news, but he said the idea Cramer knows what will happen and you will profit if you watch, is a fraud and CNBC needs to change so Jon can go back to making fart sounds and funny faces. I've tried to find out how the "Action Alerts Plus" portfolio has done that Jim Cramer mentions many times a day on CNBC. My guess is he works for next to nothing on CNBC compared to the salary he draws from TheStreet.com for "advertising and promotion" which is spelled out in the SEC filings. The idea is spout so many buys and sells with impossible to follow speed so viewers are left with paying for his recommended portfolio via a subscription. How many are smart enough to ask for 1,3, 5 and 10 year returns for Cramer's "Action Alerts Plus" portfolio he touts daily on CNBC? I emailed TheStreet.com and asked for returns before I'd consider subscribing and the reply was to call a phone number they sent. Do you think they'd make it so hard to get Cramer's record for a MANAGED portfolio if it was a good record? I am proud of my investment record and make it public HERE for all to see. Why won't Cramer do the same for his "Action Alerts Plus" portfolio? I think you know the answer. I don't think Stewart went far enough. Why not ask Cramer how many of the stocks he recommended as the keynote speaker at the "6th Annual Internet and Electronic Commerce Conference and Exposition" are still in business or if any are selling for half the price he recommended them for. You want winners? You want me to put my Cramer Berkowitz hedge fund hat on and just discuss what my fund is buying today to try to make money tomorrow and the next day and the next? You want my top 10 stocks for who is going to make it in the New World? You know what? I am going to give them to you. Right here. Right now. OK. Here goes. Write them down -- no handouts here! : 724 Solutions (SVNX), Ariba (ARBA), Digital Island (ISLD), Exodus (EXDS), InfoSpace.com (INSP), Inktomi (INKT), Mercury Interactive (MERQ), Sonera (SNRA), VeriSign (VRSN and Veritas Software (VRTS). We are buying some of every one of these this morning as I give this speech. We buy them every day, particularly if they are down, which, no surprise given what they do, is very rare. And we will keep doing so until this period is over -- and it is very far from ending. Heck, people are just learning these stories on Wall Street, and the more they come to learn, the more they love and own! Most of these companies don't even have earnings per share, so we won't have to be constrained by that methodology for quarters to come. Read the full article and then check to see how those 10 stocks did. Keynote speakers are not chosen to give short term trading advice. 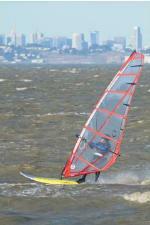 Subscribe NOW and get the October 2009 Issue (or current month) for FREE! ! How low can the stock markets go? Nouriel Roubini, called "Dr. Doom" by many who didn't like his message last year before the markets crashed over 50%, says they can go much lower. In the best case, Roubini sees the S&P500 (closed today at 676.53 - Charts) at 720, a gain of 6.4%. In the worst case, Roubini thinks there could be another 20% left in the decline with the S&P500 falling as low as 500 to 600 with the DOW down to 5,000 or 6,000. The good news is he thinks liquidity measures instituted around the world have lessened the chances for a meltdown into a full depression, but there is a rising risk of an L-shaped "near depression" recovery. This means he thinks it will be many years for the economy to recover, not the one year for a recovery as many like Abby Cohen and Bob Brinker believe. "If you take a macro approach earnings per share (EPS) of S&P 500 firms will be – quite realistically in 2009 - in the $ 50 to 60 range (I say realistically as some may even argue that in a severe recession they could fall to $40). Then, the question is what the multiple, i.e. the price earnings (P/E) ratio will be on such earnings. It is realistic to expect that the multiple may fall in the 10 to 12 range in a U-shaped recession. Then, even in the best scenario (earnings at 60 and P/E at 12) the S&P index would be at 720. If either earnings are closer to 50 or the P/E ratio is lower at 10 then the S&P could fall to 600 (12 x 50 or 10 x 60) or even to 500 (10 x 50). Equivalently the Dow (DJIA) would be at least as low as 7000 and possibly as low as 6000 or 5000. And using a similar logic we argued that global equities – following the US - had another 20% plus downside risk." Of course you cannot rule out another bear market sucker’s rally in 2009, most likely in Q2 or Q3: the drivers of this rally will be the improvement in second derivatives of economic growth and activity in US and China that the policy stimulus will provide on a temporary basis: but after the effects of tax cut will fizzle out in late summer and after the shovel-ready infrastructure projects are done the policy stimulus will slack by Q4 as most infrastructure projects take year to be started let alone finished; similarly in China the fiscal stimulus will provide a fake boost to non-tradeable productive activities while the traded sector and manufacturing continues to contract. But given the severity of macro, household, financial firms and corporate imbalances in the US and around the world this Q2 or Q3 sucker’s market rally will fizzle out later in the year like the previous 5 ones in the last 12 months. On the downside we have argued here that there is at least a third probability of a L-shaped global near depression rather than the mere current severe U-shaped recession. If a near depression were to take hold globally a 40% to 50% further fall in US and global equities from current levels could not be ruled out. But in this L-shaped near depression the last thing one would have to worry about would be stock markets as more severe issues would have to be addressed (unemployment rates in the mid-double digits – 15% or above - and multi-year stagnation and deflation). Earlier this year – at the peak of the latest bear market rally - I met Abby Cohen – the ever bullish equity markets expert at Goldman Sachs who predicted a 25% equity rally for 2008 and is making again a similarly bullish call for 2009. I asked her if we disagreed on earnings or on the multiple (P/E). It turns out that our forecast for earning per share for S&P 500 firms are similar: 50-60 range for me, 55-60 range for her. But she argued that a P/E in the 10 (to) 12 range was too low as investors would ignore the bad earnings numbers for 2009: if a rapid recovery of earnings were to occur in 2010 and beyond investors would discount the 2009 bad number and assign to them a much higher multiple of 17 or even more. Roubini thinks Cohen is wrong. He does not believe we will have a significant economic recovery in 2010. The trouble with that argument is that, with the US and global economy in a massive slump and with deflationary forces at work it is hard to believe that a massive economic recovery will occur in 2010 thus lifting sharply earnings: even in a U-shaped scenario US growth in 2010 would be 1% or lower and Eurozone and Japanese growth would be close to 0%. Thus, with weak growth deflationary pressure would be still lingering thus putting pressure on profits, pricing power of firms and thus profit margins. Thus, even in a U-shaped scenario a rapid rally of equities is highly unlikely. Also the “6-9 months ahead forward looking stock market view” is not always borne in the data. During the last recession the economic bottomed out in November 2001 and GDP growth was robust in 2002 but the US stock markets kept on falling all the way through the first quarter of 2003. So not only the stock market were not “forward looking”: they actually lagged the economic recovery by 18 months rather than lead it by 6-9 months. A similar scenario could occur this time around: the real economy sort of exits the recession some time in 2010 but growth is so weak and anemic while deflationary forces keep an additional lid on pricing power of corporations and their profit margins that US equities may – like in 2002 - move sideways for most of 2010 – with a number of false starts of a real bull market – as economic recovery signals remain mixed. Thus, most likely we can brace ourselves for new lows on US and global equities in the next 12 to 18 months. Eventually a more sustained recovery will occur once we are closer to clear signals that this ugly global U-shaped recession is not turning into a L-shaped near depression and that the global economic recovery is clear and sustained. Until then expect very volatile and choppy US and global equity markets with new lows reached in the next months and the year ahead. Roubini was correct as the "bear voice" on Larry Kudlow's show during most of 2008 when he argued Larry and the rest of the bulls were too optimistic. I hope he is wrong and the markets recover soon with the Obama and Chinese stimulus efforts. I don't believe anyone can time the markets, but those who are correct in the recent past sure get a lot of press. Subscribe NOW and get the March 2009 Issue for FREE! ! Today CNBC's Rebbecca (Becky) Quick (Anchor Women of CNBC) spent three hours with Billionaire investor Warren Buffett, Chairman and CEO of Berkshire Hathaway (BRKA Charts). Mark-to-Market Accounting: Buffett said he was not in favor of eliminating "market to market" accounting. He says too many took advantage of accounting tricks in the past so this is needed to keep companies honest. He suggested a great idea that we change the rules that require companies to raise capital on mark-to-market triggers. Uptick Rule: Buffett is in favor or reinstating the uptick rule. Market timing: Buffett said nobody can time the market, including him. Sure he would have done better to have waited but he still likes good stocks for the long term. We've had an economic Pearl Harbor. "You have got to win the economic war, that is the only priority." Doing too much too fast on other things like carbon emissions and health care. They are not as important for the moment. A lot of things attached to the "stimulus" plan were not what he would like to see right now. "you are not going to get people behind you if you try and cram things down their throat" in reference to the "Cram down" rule forcing banks to break legal contracts called mortgages. When you went back to Pearl Harbor, you did not have 535 Congress people criticizing every move FDR made. Speed of turnaround depends on wisdom of government policies. I will be updating this article during the day so check back tomorrow. John Stewart of "The Daily Show" took exception to the populist rant of CNBC commentator Rick Santelli. Santelli complained about President Obama wanted to use some of the tax payer money to help people stay in their homes rather than give more of it to Wall Street crooks and liars. Stewart makes a point with this video that Wall Street "experts" were just as responsible for the problem as the people who lied about their incomes to buy homes they could not afford. They were ALL CLUELESS! To make his point, Stewart showed this video on March 4, 2009. The video summarizes the CNBC advice and interviews of key people during the financial meltdown. Video titled "CNBC Gives Financial Advice"
Jim Cramer says Bear Stearns is fine days before it goes under. Charlie Gasparino: Obviously AIG is not going to go bankrupt... They did! The CEO of AIG says AIG doesn't need capital. Larry Kudlow, April 16, 2008 DOW at 12,619: "The worst of this subprime business is over." 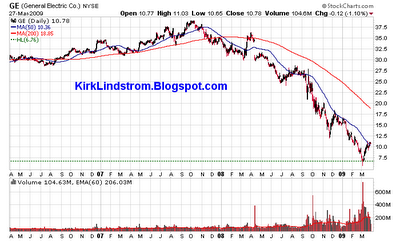 Jim Cramer, June 13, 2008: "Very simply, I believe that it means it is time to BUY, BUY, BUY!" A friend sent me this via email. DRINKBOND and ALKBOND drop in price by 95%. PUKEBOND performs better, stabilizing in price after dropping by 80%. That story almost makes me want to take up drinking again! Jim Rogers Bearish, Likes Land on Larry Kudlow's "The Kudlow Report"
Jim Rogers, the investor who had co-founded the Quantum Fund with George Soros, said on Larry Kudlow's CNBC show "The Kudlow Report" that U.S. stocks have yet to hit their bottom in this bear market. Rogers said there could be no lasting rally until the economy recovers. Rogers told Larry Kudlow that he is still solvent and he believes the fundamentals for commodities are getting better. Rogers said the firm he is a director of is buying farm land in Canada and Brazil. Rogers says Geithner and Bernanke "don't get it." Kudlow asked about the dollar. Rogers said this is an "artificial rally in the dollar" due to short covering. Rogers mentioned President Obama raising taxes on energy and capital. He made fun of the "Geniuses in Washington" who are going to raise taxes on capital and energy, something he says there is a shortage of. Earlier today Rogers told Reuters he was unsure where to invest but he thought the US dollar was "terribly flawed" and we would not have a lasting recovery the government is not allowing failing businesses to go bankrupt. "I don't think the bottom is here, maybe 'a' bottom, but not 'the' bottom. The economy is going to get worse. You can't have a good stock market without a good economy." "I want to get out of the U.S. dollar sometime this year, at least I plan to, because it's a terribly flawed currency." "I don't know where I'm going to wind up putting my money. But at the moment I'm doing nothing but watching. I may just have to wind up putting it all in commodities because commodities are the only thing (whose) fundamentals are being enhanced." I recommend a "core and explore" approach to investing. This means you place 80 to 95% of your assets in one of my core portfolios made up of index funds from Vanguard (or Fidelity). Then you invest the remaining 5 to 20% in my explore portfolio which is mostly invested in volatile, individual stocks. My newsletter stocks are volatile by design to add to overall returns via rebalancing (taking profits when the stocks are up and buying the stocks back when prices are down, but you need a good core portfolio to sleep well at night. Today the Federal Reserve and the US Treasury announced the launch of the "Term Asset-Backed Securities Loan Facility" or "TALF" for short. The purpose of TALF is to help "Main Street" get access to credit so consumers and small businesses can once again buy goods and services on credit. This is expected to significantly stimulate the economy. Yesterday Sy Harding, president of Asset Management Research Corp. and editor of Sy Harding’s Street Smart Report, wrote an article at Stockhouse called "Investor sentiment suggests stocks may see better days soon." He says the six straight months of declines is worse than the 1930s! Harding's key reasons to be optimistic for a rally are the major sentiment indicators are near record lows, giving perhaps a "buy when there is blood in the streets" signal. The University of Michigan reported this week that its Consumer Confidence Index declined from its extremely low level of 61.2 in January, to 56.0 in February. That’s almost at its record low, which was recorded in 1980, when the economy was struggling to come out of the deplorable 1970’s plunging economy and spiraling inflation (stagflation). The confidence index dates back to 1952, so if it’s almost at its record low, consumer confidence is currently lower than it was in the severe recessions of 1981-82 and 1973-74. ... the poll of its members by the American Association of Individual Investors is considered to be at extreme pessimism whenever the poll shows bearishness has risen to more than 55%, and bullishness has dropped below 25%. In last week’s poll bearishness had risen to 56.7% bearish, and bullishness had dropped to only 21.7%, and in this week’s poll 55.1% were bearish, only 24.3% bullish. "...the VIX Index, also known as the Fear Index, is currently showing a considerably higher level of investor fear than at the bottom of any of the legs down in the 2000-2002 bear market." So far the media is laughing at the new attempts to insert some optimism into the mix. But, these are ‘blood in the streets times’, when historically extremes of pessimism do reverse, at least temporarily. And after a record six straight months down investors deserve a respite.